Today I came across a wonderful interview with Robert MacFarlane – a professor of English at Emmanuel College, Cambridge and author of numerous books – on Cabinet Magazine. While MacFarlane has written many titles on various subjects, this particular interview discusses the mountain aesthetic…our societal interpretation of mountains and the mountain landscape and how religion, philosophy, science, and society have shaped that overall aesthetic. 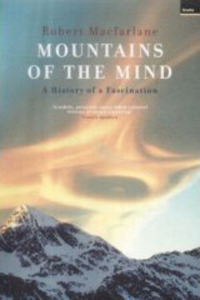 MacFarlane wrote Mountains of the Mind: A History of a Fascination in 2003, which goes into detail on the subject. The interview (O Altitudo! : An Interview with Robert McFarlane), conducted by Cabinet Magazine author Brian Dillon, touches on a number of key subjects, and while deep and heavy at times, it is still very readable and provides a fascinating glimpse on the views and ideas which have shaped our perception of and interest in mountains and the mountain world. From da Vinci to Ruskin, Bishop George Berkeley to Descartes, religion to geology to art, MacFarlane runs the gamut of our interaction with the mountain world, offering perspectives and insights not generally covered in back issues of Climbing. Descartes, is the root of science. And, I would add, wonder is the root of climbing. To me, wonder has always been the catalyst for my forays into the hills. It is not so much to prove myself, to show what I can do and how fast and well I can do it. (I know my own limits far too well to play that game!). Rather, when confronted with a mountain landscape – be it a staggering Himalayan peak, a rolling Appalachian hill, or a ribbon of ice in the San Juan Mountains – I find myself nearly overcome with a desire to know. I want to understand the landscape on a fundamental level, to feel it under my feet, to smell and taste the air surrounding it, to see the view from high mountain flanks and humble my very being in the process. Take a few moments to read MacFarlane’s interview. Give it some thought, and let me know what you think about the mountains and the mountain aesthetic. What drives you to the hills? Why do you climb, hike, trek, or just adventure? Thanks very much for all your news this year Jake, this latest one strikes a chord with me too. I hope you and your family have a peaceful and fulfilling Christmas too. I’ve been pleased with my Everest research and writing this year and currently I’m working on something new I’ve found that may be of interest to you vis a vis M&I…(this will surprise you!). Drop me an email if you’d like to know more. Thanks again for all your posts this year. Merry Christmas from sunny Australia.